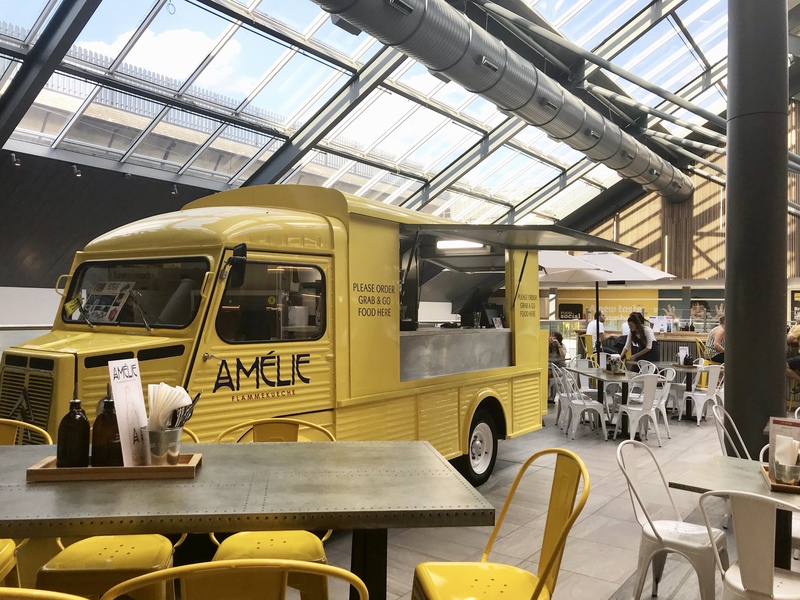 The van may suggest that Amélie is street food but it’s not and they’re not trying to be. It forms part of the overall décor and makes the space more eye-catching. 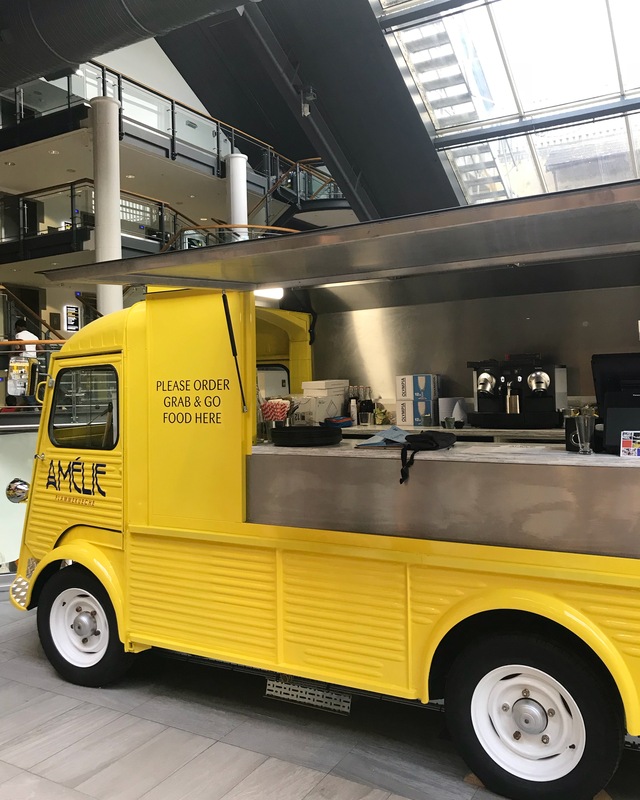 The van stocks the bar but it’s also where orders for “grab & go” are placed, for those who don’t want table service or prefer take-away. It’s a great idea to have this option, especially for those who may be watching the clock to catch a movie. 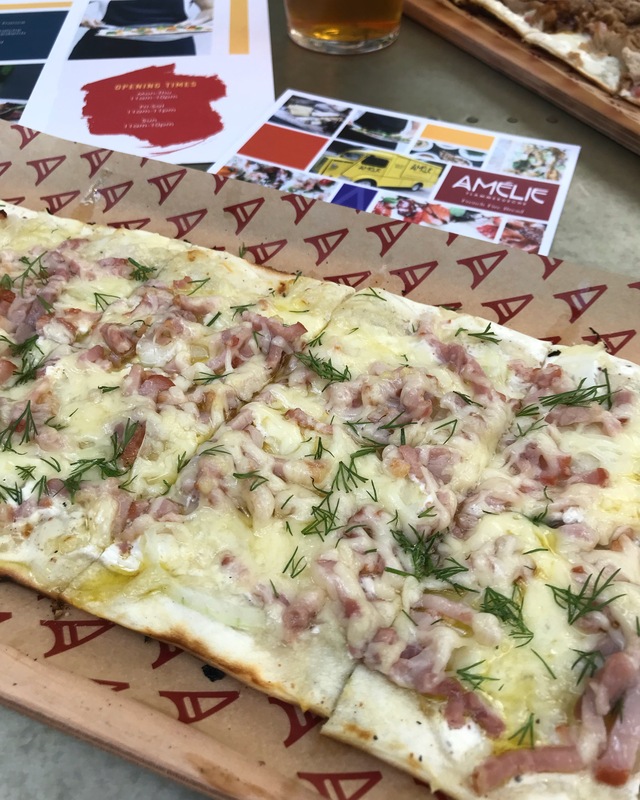 Traditional Flammekueche consists of crème fraîche, sliced onions and smoked bacon (lardons) but the concept has been adapted for the British market. 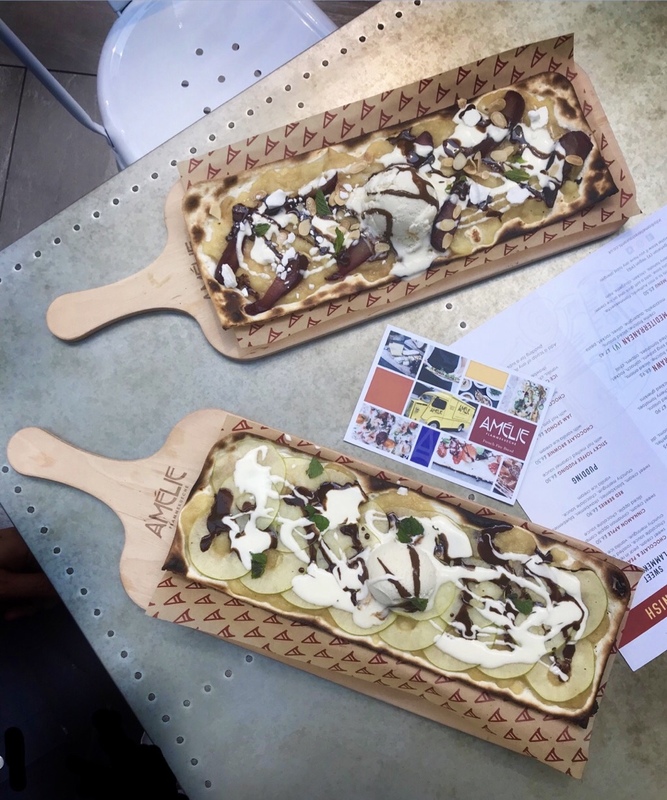 Apart from the Authentic Flammekueche on the menu, there are a further 9 savoury options with a range of toppings such as pork, chicken, salmon, avocado, prawns and beetroot as well as 3 desserts featuring chocolate, pears, apples, berries and vanilla ice cream. There are non-Flammekueche puddings too, like sticky toffee, chocolate brownie and jam sponge. 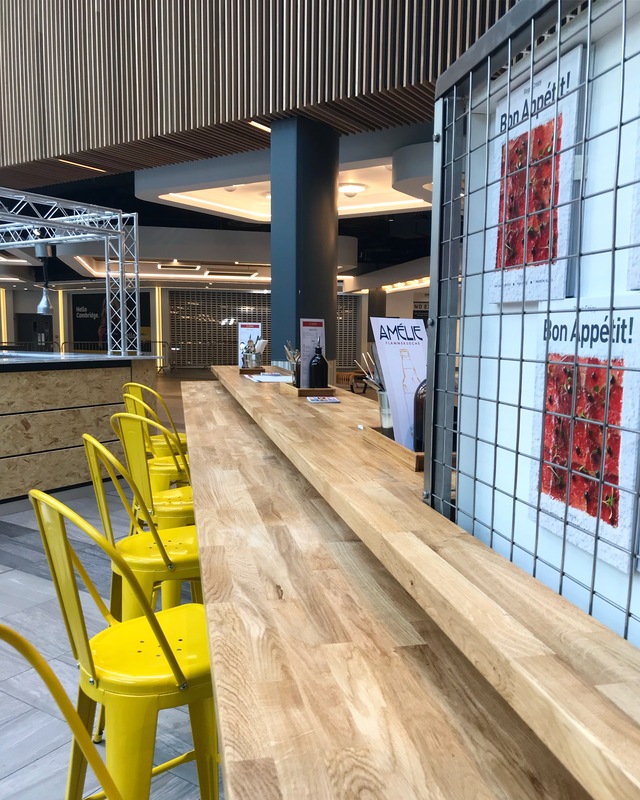 The bar has a good selection of drinks – red, white, rosé and sparkling wines, soft drinks and beers. There’s a choice of still or sparkling water and you can help yourself to jugs of tap water and glasses by the kitchen. Coffee, tea and hot chocolate are available. 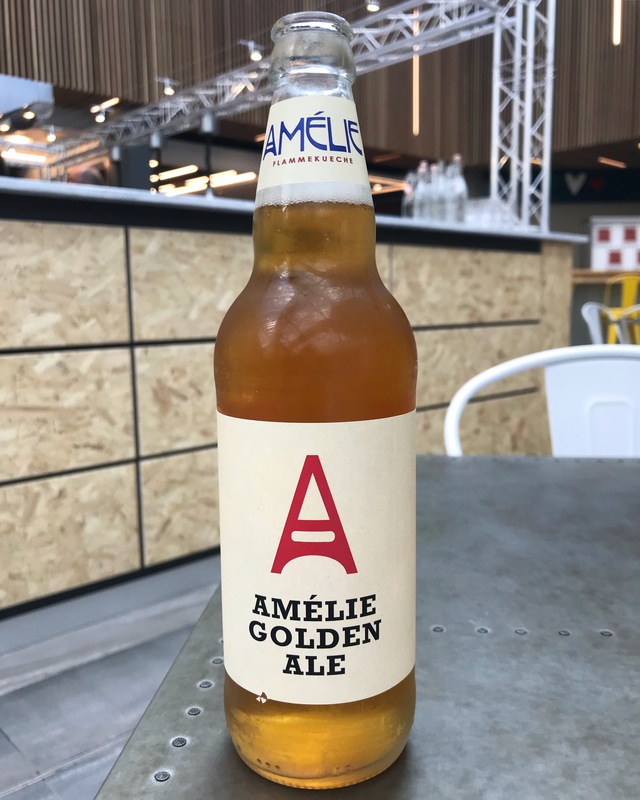 We tried Amélie Golden Ale, brewed exclusively for the restaurant by Suffolk based Nethergate Brewery. As described, it had a floral aroma with a touch of spice and a mellow bitterness from the fragrant citrus hops used in the brewing process. 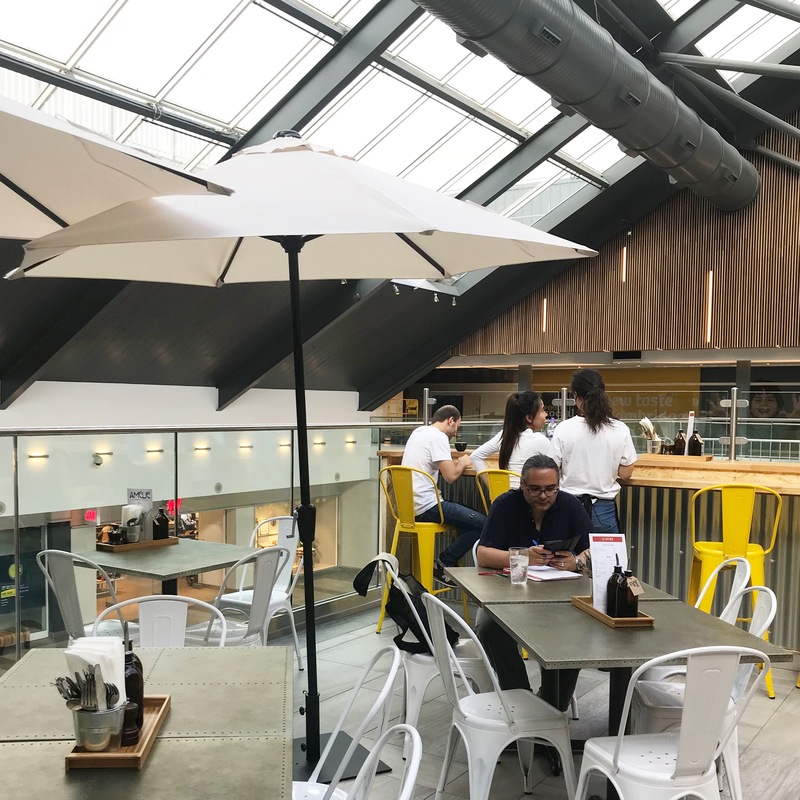 Being from the French part of Canada, I was already familiar with Flammekueche but I never had one prepared by leading chef Régis Crépy, who owns the restaurant with his son Alex. If the surname seems familiar it’s because Régis and his wife Martine ran the very successful Great House in Lavenham for over 30 years as well two other prestigious Suffolk restaurants. 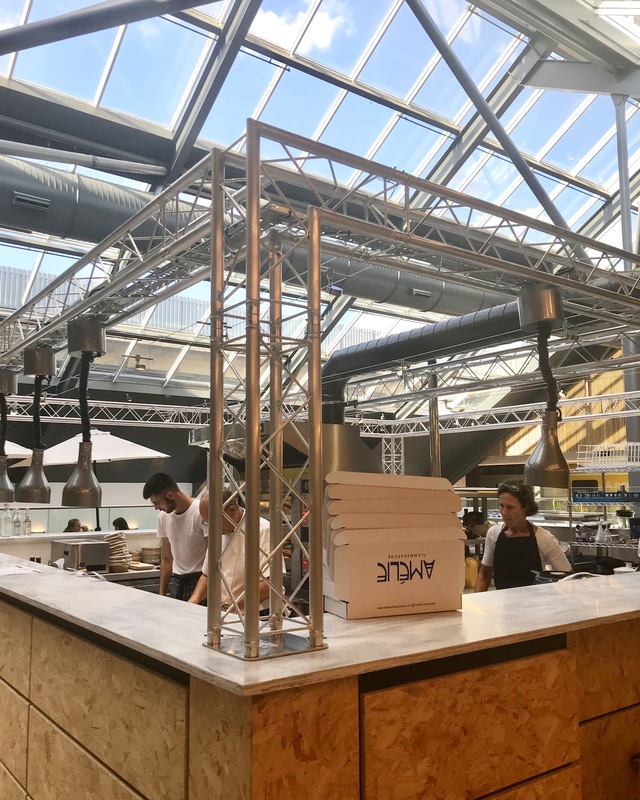 It’s a family business through-and-through with the restaurant being named after their daughter – and Alex’s sister – Amélie (who designed the menu and promotional materials). I would be remiss if I didn’t order the Authentic Flammekueche and it was delicious. I loved the seasoned crème fraîche and quality ingredients (bacon, Gruyère and onions), all drizzled with olive oil. There are bottles on the tables for extra drizzling. Paulo ordered the Pulled Pork variation with crème fraîche, sliced onions, smoked bacon, soy pulled pork, chilli and hoisin sauce. It was delicious too. 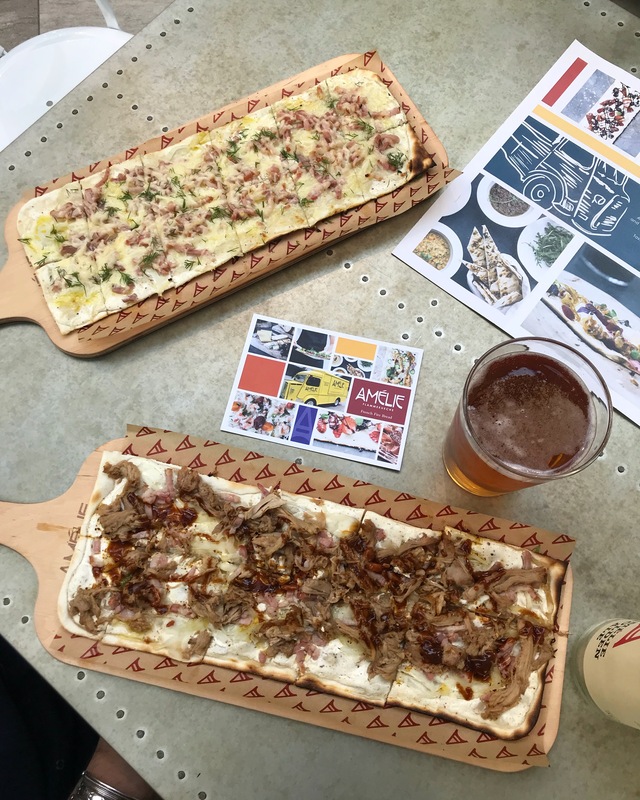 The Flammekueche is served already sliced into squares to make sharing and eating easier. It can be messy to eat, especially with your hands (my preferred method), but napkins and cutlery are provided. For vegans or those who prefer a rich tomato base to substitute the crème fraîche, Amélie can adapt the Flammekueche into a “flammpizz”. We couldn’t leave without trying some sweet Flammekueche for dessert. 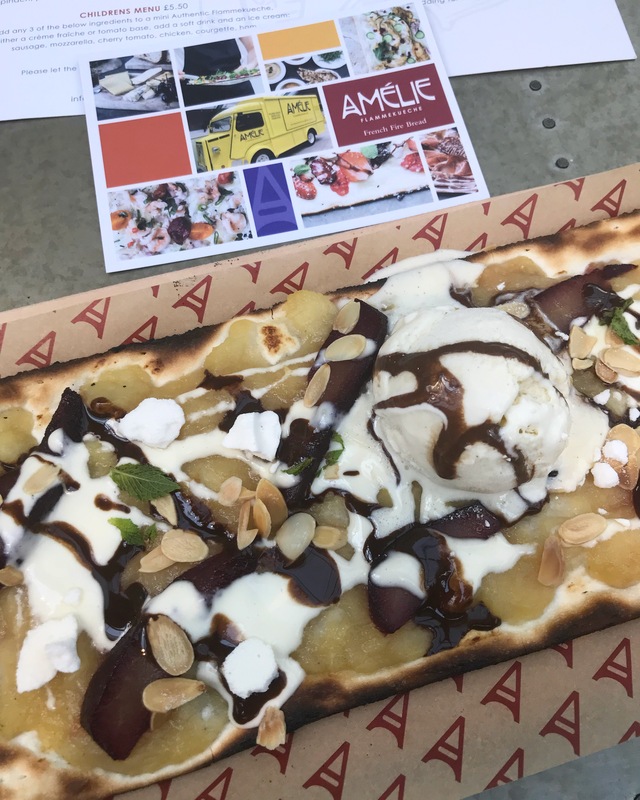 Paulo had the Chocolate & Pear with sweet cream, pear in red wine, chocolate sauce, roasted almonds, crunchy meringue and vanilla ice cream. A work of art! The sweet Flammekueches aren’t served pre-sliced as it would ruin the presentation but we enjoyed digging in. 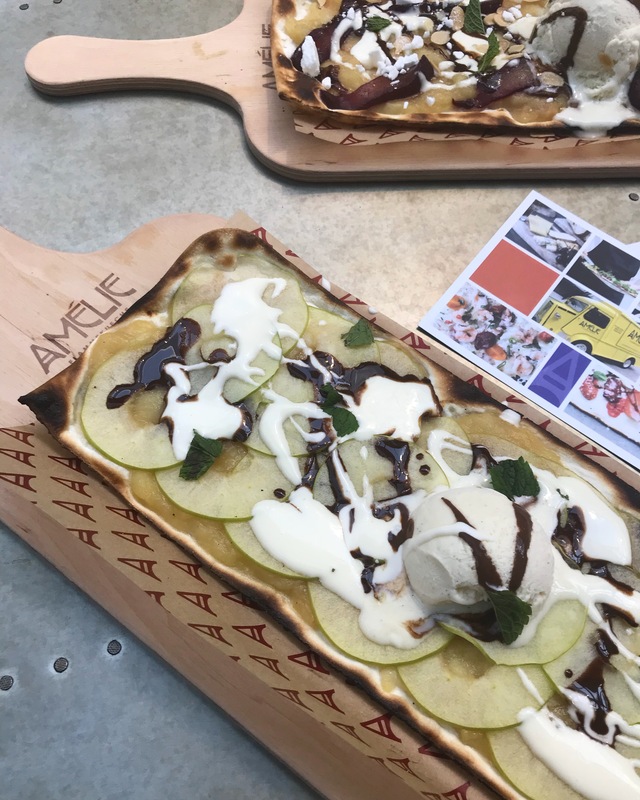 I had the Cinnamon Apple Flammekueche with sweet cream, cinnamon apple compote, sliced apples and chocolate sauce. Mine had a scoop of vanilla ice cream on top. I’m not sure if that was supposed to be there as it wasn’t listed on the menu but I appreciated it anyway. 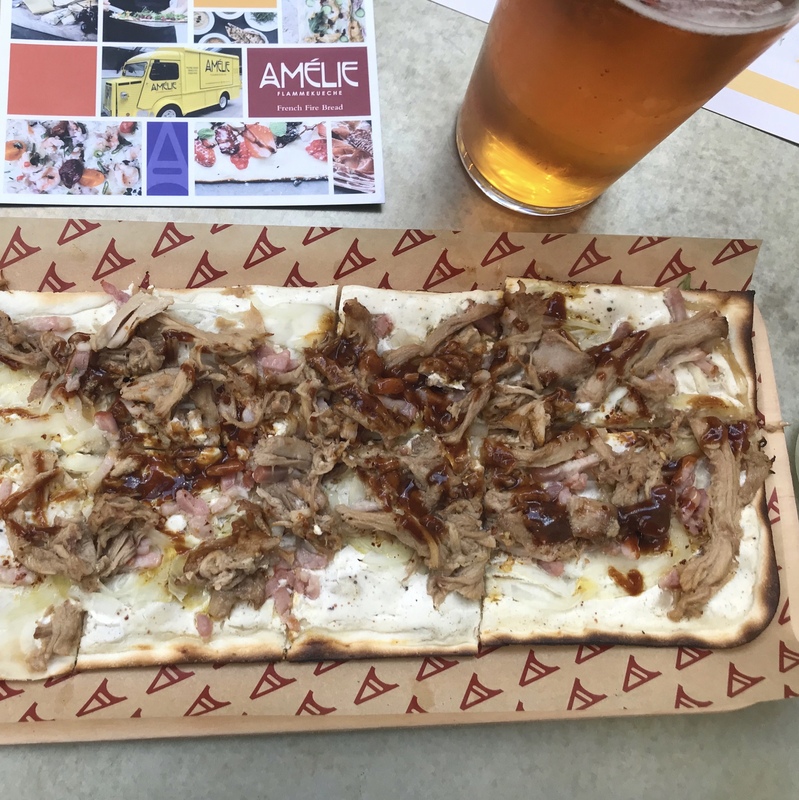 I love the fact that Amélie have not called Flammekueche a pizza in order to compare it to a more familiar product in the UK. I noticed they have purposely avoided using the P word in their marketing and come up with their own translation (French fire bread). It’s not a pizza at all. Their product, although adapted to the UK market, pays homage to this classic dish. It stands on its own. 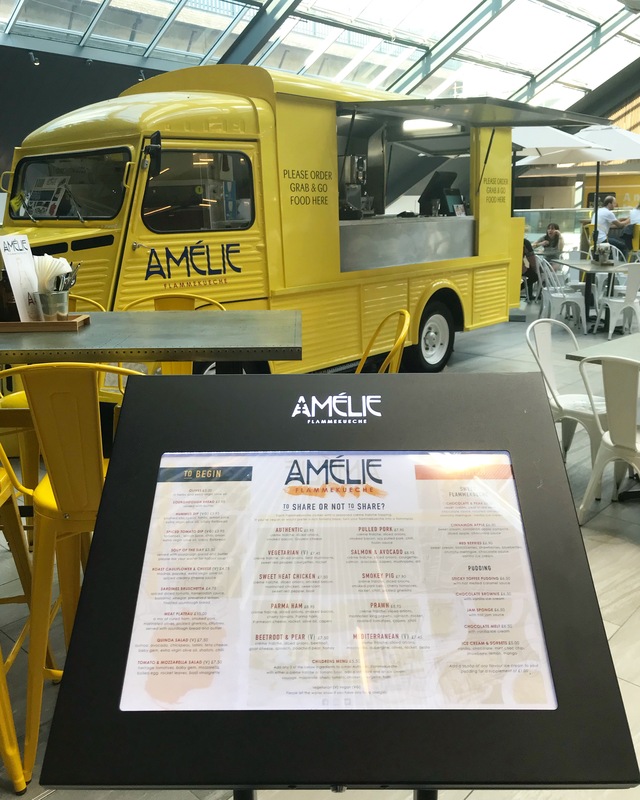 It’s important for a new concept to be introduced in a proper and respectful way, which is what Amélie have accomplished. 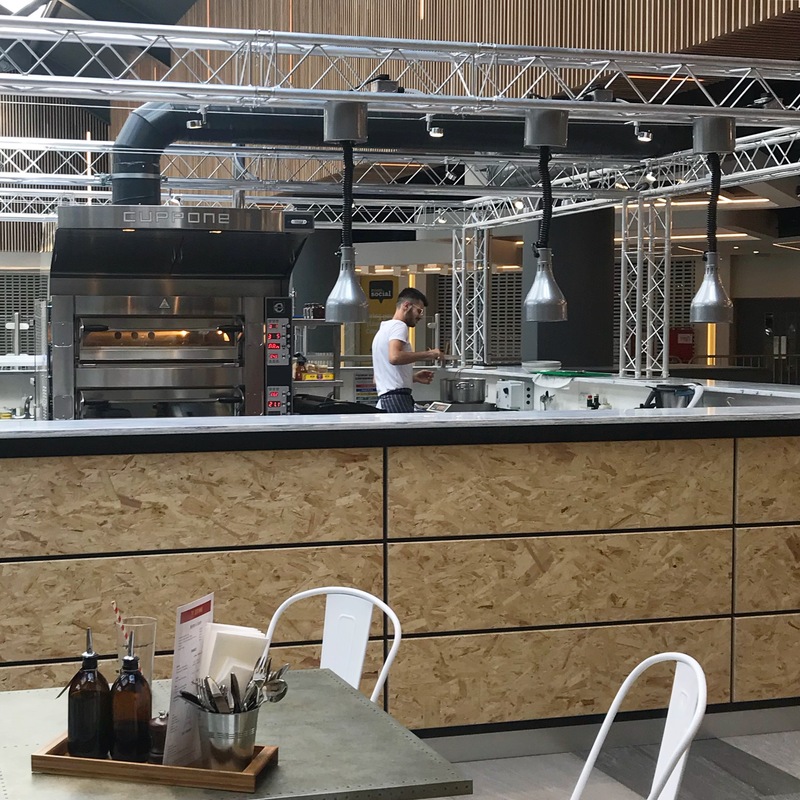 I also think that removing any comparisons to pizza helps eliminate any pre-conceived notions about what pizza should taste like… because if you’re expecting to have pizza, you might not appreciate the true essence of Flammekueche. And besides, it’s fun to say “flahm-koosh”! 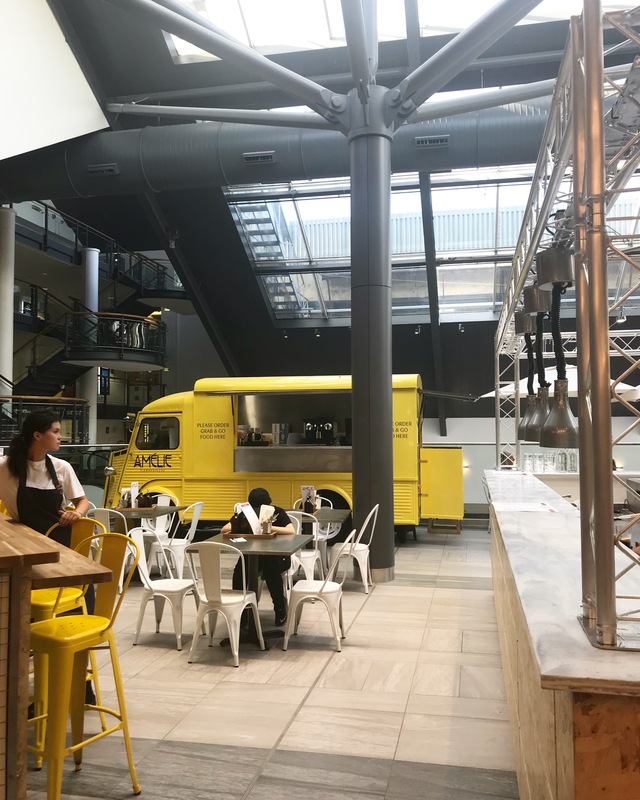 They are having a soft opening until 12 August 2018, which means 50% off on all food while they find their feet. We went on the first day and, although they are still practicing and training, the food and service were great. 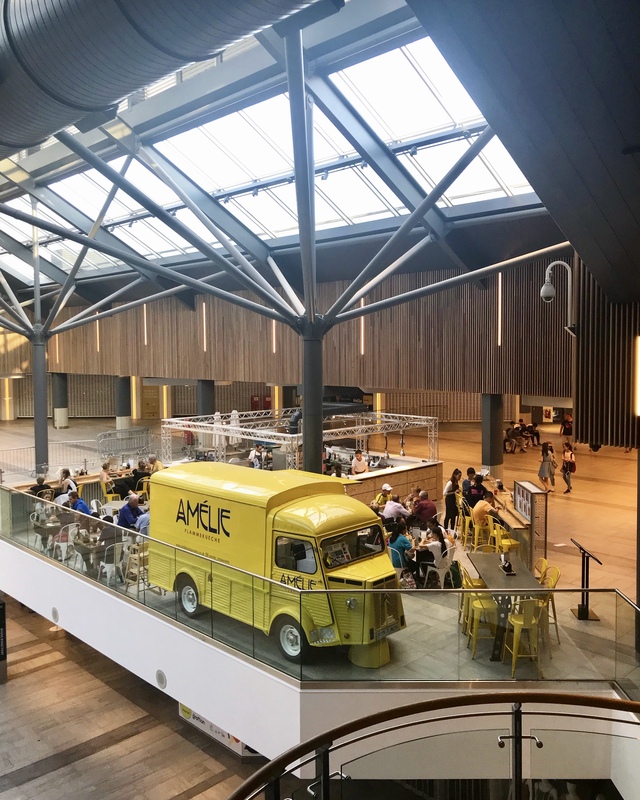 Bienvenue à Cambridge, Amélie! I was invited for a complimentary dinner for two. I did not receive compensation for my review. All views are my own. 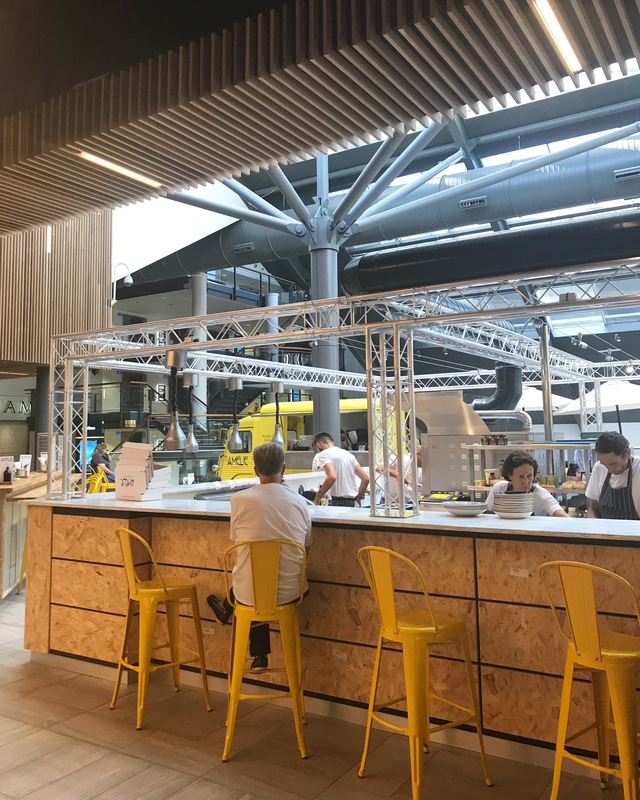 This entry was posted in Restaurants and tagged Alex Crepy, Alsace, Amélie Flammekueche, Amélie Restaurants, Cambridge, Flammekueche, Flammkuchen, Food Social, French fire bread, Martine Crepy, Regis Crepy, tarte flambée, The Grafton by One Two Culinary Stew. Bookmark the permalink. I can’t remember when I last visited the Grafton but this already sounds like a marked improvement. 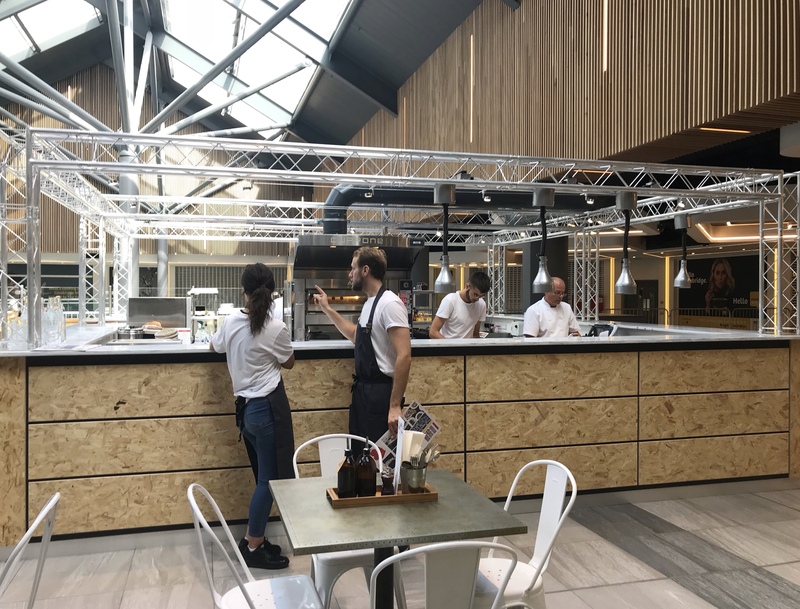 The extensive refurbishment is looking good and I can’t wait to see who else will be at Food Social.